My husband Dave and I were delighted to discover in 2011 that we were expecting another baby. As my pregnancy with our third daughter progressed, I had an instinct that all was not well with our baby. Scans during the 35th week confirmed my suspicions, that our baby was too small and not moving, so it was decided that she would be born by caesarean section at 36 weeks. Unfortunately, no-one could have predicted quite how seriously our unborn daughter had been affected during her prenatal development. During the first moments after birth, Beatrice (who weighed 3lb 14oz) was whisked away, and after what felt like an eternity we were told that Beatrice was very ill and to expect that she would pass away soon. In preparation, we wrapped her in a beautiful striped blanket and cuddled her tightly as we rang family and broke the devastating news. After a few hours, it became apparent that Beatrice was breathing comfortably on her own, so it was decided to take her to SCBU where she was placed in an incubator and fed via an NG tube. Visiting Beatrice at her cotside was very traumatic. The baby in front of us was so different from our other daughters, and from the image we had in our minds, but we adored her all the same. The following days were a blur of tears and unanswered questions. We took many photos and proudly brought her older sisters in to meet Beatrice. Explaining to them that she would go to Heaven soon was the hardest thing I’ve ever had to do. After a few days, all genetic tests came back clear, so it was time to carry out an MRI. The results of this were described as ‘devastating’ by the consultant who broke the news to us. Beatrice had a brain so underdeveloped and smooth (lissencephaly) that it could have stopped growing in the first 12 weeks of pregnancy. 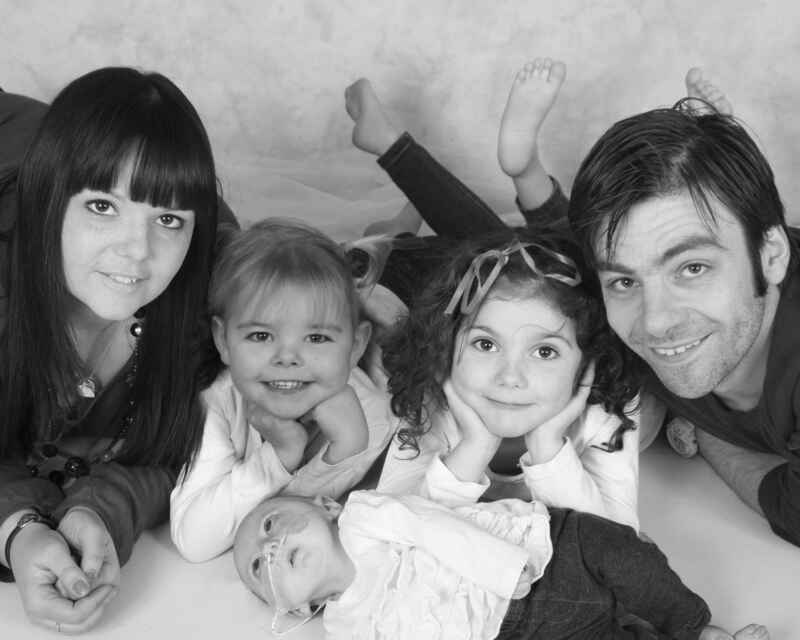 Added to this, she was diagnosed with central arthrogyposis, which explained her severe muscle contractures and why she had not moved in utero, or since birth. We were warned she would likely be deaf and blind with little or no awareness of the world around her. They anticipated she would suffer from seizures and her life expectancy was poor at best. Given this information, we chose to take Beatrice home to meet her wider family and make some memories to treasure, in place of the future we had dreamed for her. We were assigned a community nurse and the GP came to visit. We were advised that Beatrice would likely pass away in her sleep ad we were told what to do if we woke and found this had happened. Looking back now, it was a very surreal period of time. People came to visit our new baby, but everyone cried and grieved rather than celebrated her arrival. Registering her birth was bittersweet, and I often wished I could just stop the clock and hold Beatrice forever. Days soon turned into weeks. Life wasn’t without its difficulties. Beatrice struggled to take a bottle, and eventually began to choke on her milk so the decision was taken to withdraw all oral feeds. Life began to fall into a rhythm, and we got used to the 3 hourly tube feeds. Beatrice was so small and delicate that going out and about was daunting, but with two older girls, we had no choice! Weeks turned into months, and we hardly dared to think about a possible future. It was decided to correct her club foot, and she began weekly plaster casting (ponsetti treatment) before beginning to wear a body brace for her hips, then hand splints and a foot splint. Then, just before Christmas, I woke one morning to my worst nightmare. Beatrice was lying in her cot, completely grey and struggling to breathe. 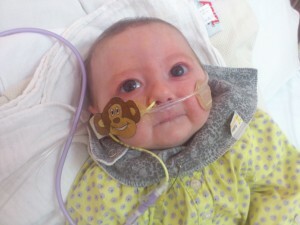 She ended up in hospital with her first pneumonia and she needed continual oxygen to help her breathe. In order to take her home for Christmas, we were given an oxygen concentrator at home, and portable cylinders for travelling, and so the next chapter in our lives began. Christmas was a huge milestone, and we began to realise that Beatrice was more aware of sound and some light than we had first believed- a lovely gift for all of us! More hospital admissions followed in the new year, and realising we needed more help as a family, I self-referred to Helen House Hospice in Oxford. We went to visit and our first stay was booked for the beginning of February. Towards the end of January, Beatrice fell ill yet again, and after a week’s stay in hospital, it seemed she was picking up. How wrong we were. Suddenly, Beatice began to suffer from long apnoeas (periods of not breathing) and was rushed to HDU. There, her condition deteriorated rapidly. 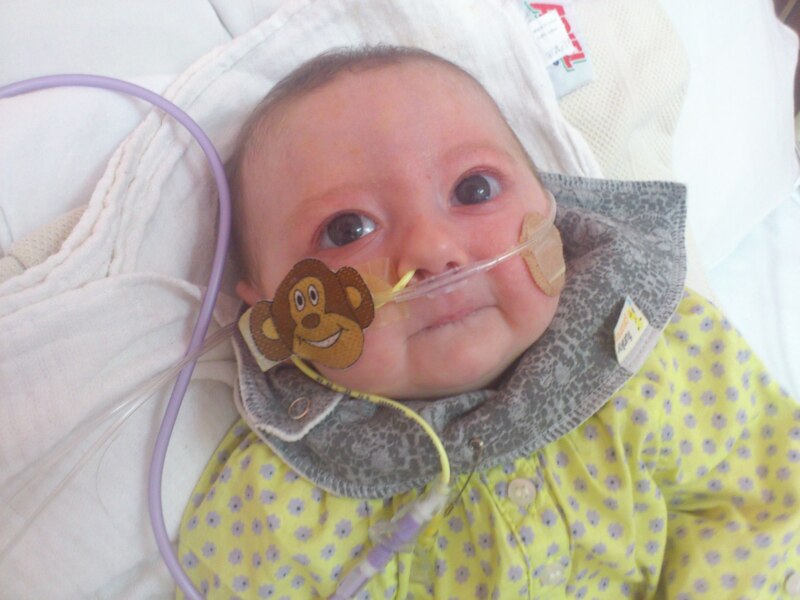 We were asked if we wanted Beatrice to be transferred to another hospital where she could be put on a ventilator. Knowing how traumatic this would be for her tiny body, we made the only decision we felt we could- we would stay put and let Beatrice slip away, if it was time for her body to give up. We had Beatrice baptised at her bedside as I held her in her striped blanket. Then, it was time to sing her lullabyes and call the family to tell them the tragic news. As her respitory rate dropped to 4 breaths per minute, the nurse stayed with us as we prepared to say goodbye. My heart was broken and I couldn’t see for tears. I didn’t want the older girls to see their sister die, so I told Beatrice she could go to sleep and her sisters would come in the morning.At 4am, without warning, Beatrice’s eyes sprung open and she fixed hers onto mine. Steadily, her respitory rate increased, and my hopes were raised, although the consultant told us she could pick up briefly before passing away. But the morning came, and the older girls came to visit their sister. I told them it was likely time for Beatrice to leave us, and they took it in their stride- no tears for Evie and Mabel. It seemed impossible, but as the hours passed, it was decided that Beatrice was getting better and could leave HDU. The entire family came to visit her, not knowing if they were saying hello or goodbye. Only Beatrice would decide. And decide she did. On the Friday, we transferred to Helen House in an ambulance as originally planned, where we enjoyed a respite stay before coming back home. The months that followed that particular episode have been chaotic. Beatrice became unable to tolerate any food in her stomach and it was decided to feed her on a continual pump via an NJ tube directly into her gut. Her surgeon would like to give her an operation to place a permanent feeding tube, and eradicate her severe reflux, but the anaesthetist knows she would not survive a general anaesthetic, so we have no choice but to manage as best we can with the current feeding regime. It’s not all bad news though, Beatrice has made some exciting progress- she now fixes on objects and follows them with her eyes, even moving her head at times. Her hearing is perfect and she not only reacts to sounds, but recognises familiar voices. She has begun to have more movement in her limbs, but she still has no purposeful movement and cannot reach out and grasp objects. She cannot roll or sit independently, but sometimes, just sometimes, we will see a flicker of a smile and that is a true gift from Beatrice to us. We continue to visit Helen House where Beatrice loves the sensory room for all the lights. She has weekly music therapy sessions at home from Thomas’ Fund, based in Northampton. Beatrice has thrived since starting this therapy, showing a love of the flute and chime bells. She even made a choice with her eyes recently- choosing the shiny tambourine over the big, colourful drum! Once a week, Beatrice attends a Conductive Education session at the local special school, and here she practices her physical skills- perhaps due to this, she can even hold her head independently now for quite some time. Life isn’t always easy. Beatrice has a lot of equipment to carry about, and we still don’t have a suitable pushchair to do this, as well as supporting her breathing by offering a good seating position. She still suffers from severe reflux and these cause apnoeas, especially at night. However, as a family, we refuse to allow Beatrice’s disabilities to stop her leading a full life. This summer, she even got her first passport and went to Lourdes with a children’s charity. Her sisters are adamant that we will take her to Disneyland Paris one day, and I am confident that we will manage this eventually! We also want to provide Beatrice with multiple sensory experiences at home, so we hope to prepare a room in our house with various sensory equipment- in particular, lights and music. Beatrice has been the best, most unexpected gift we could have hoped for. She has changed our core and wider family beyond recognition. Everyone who meets her seems to lose a little of their heart to her, she has a beautiful ability to bring out the caring side in most people. If love could solve everything, Beatrice would live with us forever. Sadly, it can’t, and we know that one day we will have to say goodbye to our beautiful, precious butterfly but in the time we have with her, I am determined to give her the best of everything I possibly can. Sadly Bea passed away in October 2012, but the family would like to keep Team Bea to raise money for others in Bea’s memory.